A look then at Troop #4. In 1901, Chicago publisher William D. Boyce lost his way in a dense London fog. A boy came to his aid and, after guiding the man, refused a tip, explaining that as a Scout he would not take a tip for doing a Good Turn. This gesture by an unknown Scout inspired a meeting with Robert Baden-Powell, the British founder of the Boy Scouts. 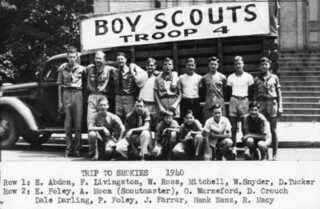 As a result William Boyce incorporated the Boy Scouts of America on February 8, 1910. He also created the Lone Scouts, which merged with the Boy Scouts of America in 1924. Troop 3 was born in Lawrenceburg, and was the forerunner of Troop #4, sponsored by Hamline Chapel United Methodist Church. Since 1917 Boy Scouts of America has been an active organization at Hamline Chapel United Methodist Church. 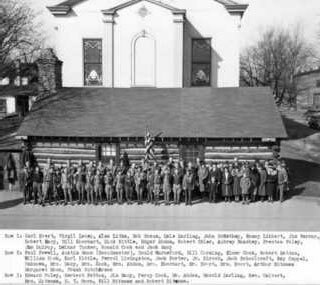 The “Boy Scout Cabin” as it is still referred to was erected through the efforts of Mr. Frank Hutchinson, inspired by this devotion to his Son and the Scout Movement, during the 1932 Depression years. In the Flood of 1937 the cabin floated off its foundation and landed upon the Ohio River Levee, Mr. Hutchinson and the Church Trustees had it replaced upon its original foundation where it served 20 years many young men of Lawrenceburg. In 1957 as a part of the Church’s greatest building and remodeling program Mr. Jack Anderson, building committee chairman, prevailed upon the City of Lawrenceburg to vacate New Street to allow more room to build the new Church School building and relocate the Cabin. New footers, foundations, concrete floor, fireplace, water, gas heat, and a new roof was installed. Due to “progress”, the cabin is gone forever. It was demolished in 2012 to make room for an alley to access the city’s new event center. 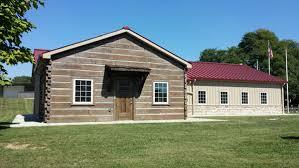 The new Scout Cabin is located at the end of High Street by the tunnel. The cabin is really available to non-sport related groups, but has a dedicated scout room that is behind the rustic cabin facade shown at right. Come join us!